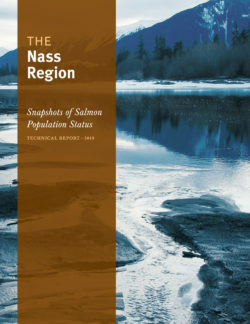 The Pacific Salmon Foundation (PSF) has collaborated with the Nisga’a, Gitanyow, and Gitxsan First Nations, LGL Limited, and Fisheries and Oceans Canada (DFO) to bring together the best available data for describing the dynamics and characteristics of all genetically, ecologically, and geographically distinct populations of salmon (known as Conservation Units under Canada’s Wild Salmon Policy) in the Nass Region. All of the compiled information has been visualized and made accessible to the public through an online platform, called the Pacific Salmon Explorer. This dynamic and interactive platform allows the public to track and compare status and trends among Nass salmon Conservation Units and explore the cumulative human and environmental pressures facing freshwater salmon habitats in the region. This project was driven by a shared interest in providing open access to data to support the development of coordinated strategies to manage and conserve Pacific salmon and the ecosystems they are a part of. This project was made possible through financial support provided by the Gordon and Betty Moore Foundation and DFO’s Coastal Restoration Fund. Providing free and open access to data is consistent with DFO’s Policy for Scientific Data. As such, funds provided by the Coastal Restoration Fund are helping the PSF provide broad public access to salmon data beyond the Nass Region and expand this online platform to other major salmon-bearing watersheds in BC including Vancouver Island and the Fraser River watershed.